Japan's answer to the BMW M4 is the Lexus RC F, available in the UK today as an alternative to the various German-badged sporty saloons on the market. Among the automaker's complete line-up the vehicle is the most athletic of them all, and promises an exciting drive in elegant surroundings. Lexus has designed the RC F to grab attention, as its vast spindle front grille proves. This sits between large air intakes on either side of the front bumper and beneath jagged headlamps with LED daytime running lights. The classic coupé shape ends at the sporty rear where L-shaped lights reinforce the brand and complement a quad exhaust system. Inside there's all the sophistication you expect from Lexus and a generous standard offering. Grey, black or red leather upholstery can be selected to join the metallic weave inlays. F SPORT details feature throughout to uphold the athletic theme, and highlights include the leather steering wheel and gear lever plus aluminium scuff plates. RC F Carbon is the range-topping trim grade, bringing Alcantara seats and carbon inlays to the cabin. 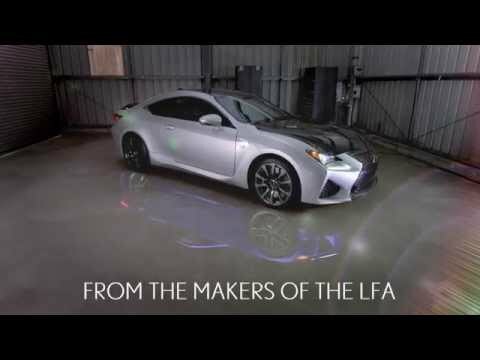 Also fitted in the cockpit is Lexus' latest technology. The premium navigation pack comes at no extra cost, merging satellite navigation with connected services and a park monitor. Audio comes from a ten-speaker system with DAB tuner, commanded effortlessly via a remote touch pad with accompanying seven-inch multimedia screen. The sole engine option is a 5.0-litre 470bhp V8 petrol that produces 530Nm of torque to accelerate with great energy through the gears. It joins up with an eight-speed automatic gearbox to deliver power, with a paddleshift manual mode included to take control of the gear changes. The 0-60mph sprint takes around 6.5 seconds before a limited top speed of 168mph is reached. Making the driving dynamic safe as well as stirring are various active technologies designed to tame the RC F's pace. With four selectable driving modes the vehicle's set-up can be adjusted for multiple journeys, and traction control (TRC) with Vehicle Stability Control (VSC) help the model remain sure-footed in all conditions. Lane Keeping Assist and Lane Change Assist are two other standard additions usually found on the options list. For more on the inspiring RC F coupé and to arrange a test drive, please enquire with Lexus Teesside online or over the phone.